Hello everybody and welcome to the Covered in Love Nov/Dec block drive post! I decided to do another throw back block drive this month, but it was only the second drive we ever did so I think not many of you have done it before. Last time I called this Patchwork Mosaic, this time I'm calling it Patchwork Surprise. 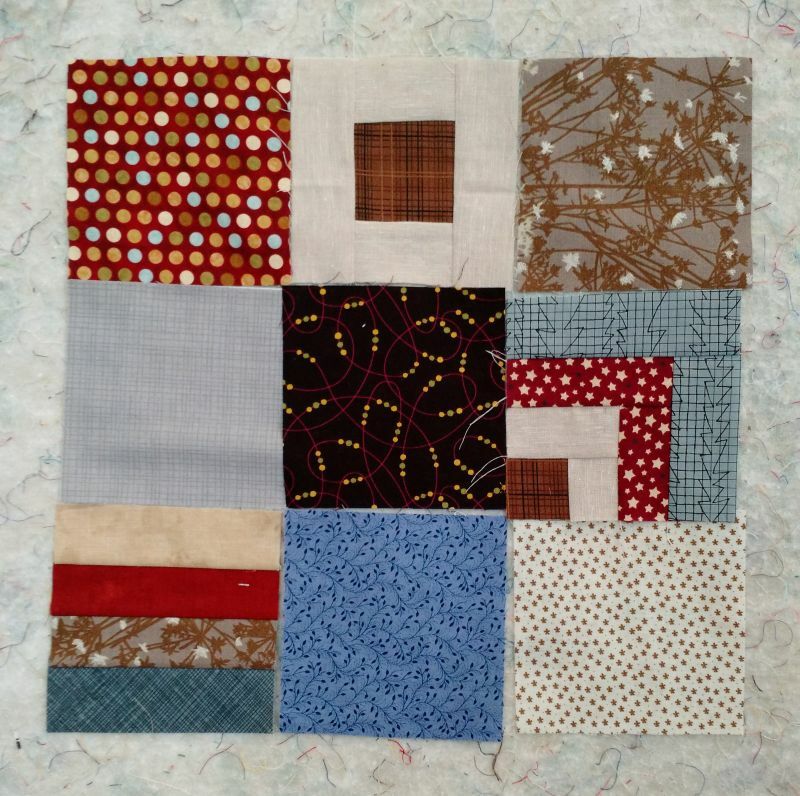 The blocks are simple 9-patches of 4.5" squares (unfinished, block comes to 12.5" unfinished). Each 9-patch is made from a mix of pieced and solid squares. 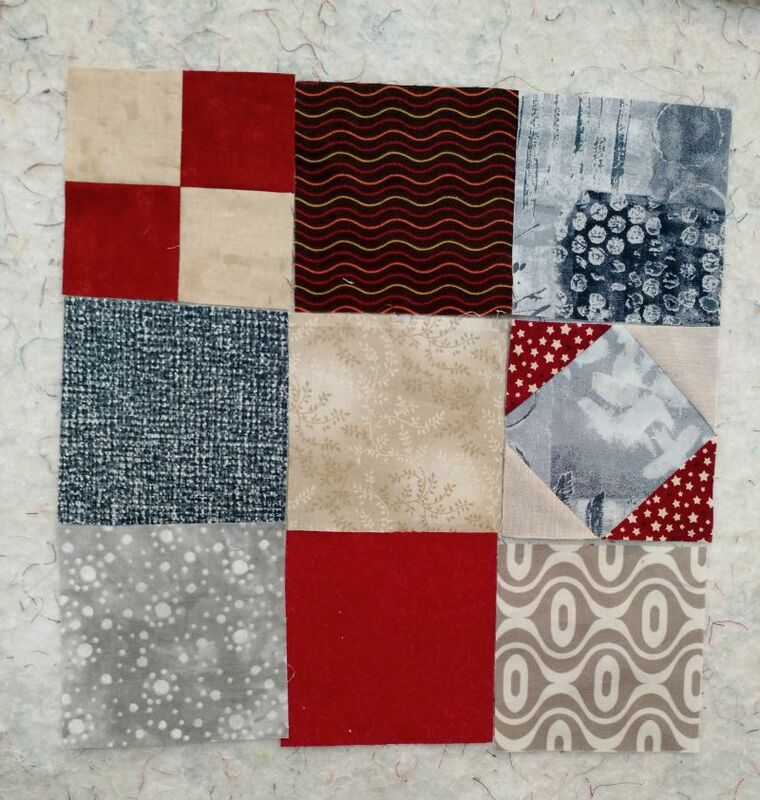 Aim for 1-3 pieced squares per 9-patch and select the rest of your squares from print fabrics that match the color scheme below. The colors are crimson, faded denim blue, dark chocolate brown, taupe, "snowy" greys, you can throw in some navy too if you want. 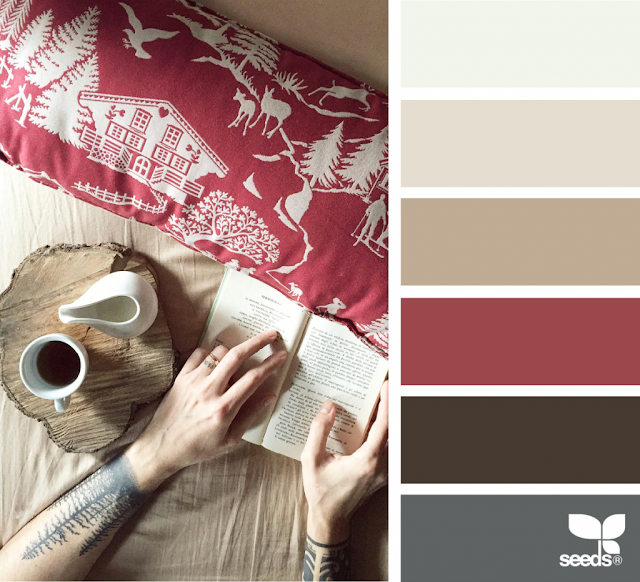 Think dark, warm, snuggled-up-in-a-cabin-in-a-snowstorm, flannel blanket type colors. 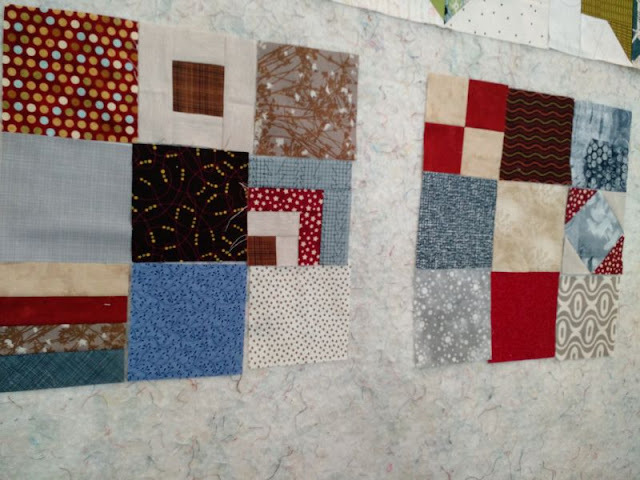 You can make your pieced blocks in any design you like. Keep it simple with a four-patch made from 2.5" squares, or a HST, or make it as complicated as you like, as long as the unfinished block is 4.5" and fits into your 9-patch. The only difference between this block drive and when we did it back in 2015 is the color scheme. So note, your blocks should NOT be in purples and greens. If you want to look at the old block drive post and the old finishes for inspiration you totally should, you can find them here and here. When we did this before 9 ladies made two quilts. There are a LOT more of you now and I can't wait to see what you come up with! For anyone who is new to CiL's block drives, welcome! Anyone can contribute to these drives and you may make as many or as few blocks as you like. Contact me by leaving a comment or email CoveredinLoveTx@gmail.com to get a mailing address and try to get your blocks in the mail by New Years. I put up a new drive every couple months and I try to mix them up so if one month you're busy, or it's not your colors, you can skip that month and join in the next. Covered in Love makes quilts of comfort which are distributed to patients who pass away at an East Texas hospital. 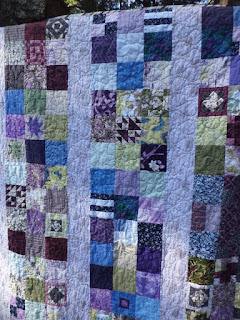 These quilts give the families something to take home to remember their loved one and find comfort in. So far over 240 quilts have been donated! Hmmm, a little more of a challenge! I’ll have to dig deep! This looks like fun! Unfortunately, most of my 4.5" patches (already cut) tend to be juvenile prints. I'll have a rummage though, and see what I have that I can use. Then I'll go into the stash to see what else I can come up with! Looks like fun, Kat! I'll go start rummaging around in my stash! Challenge accepted! I just made 10 blocks or more. It's always interesting seeing the color choices that you request. It seems that I don't have much in the way of gray or brown, but digging into the far reaches, I did just fine. I'm wondering when you'll ask us for something with a variety of low volume fabrics...cause those I've just restocked. As usual, I'm excited to send my blocks, but the 2 month time period just begun so i'll give it a few more days. I would love to make some blocks. I need address to mail them. I believe that I have more scraps than the average bear, lol. It's a good thing you posted the color names! My screen shows charcoal and the red along with beige, tan, and cream. Whew! That wouldn't have been good. I just discovered your drive today from Confessions of a Fabric Addict. I will be glad to make and send you some blocks. 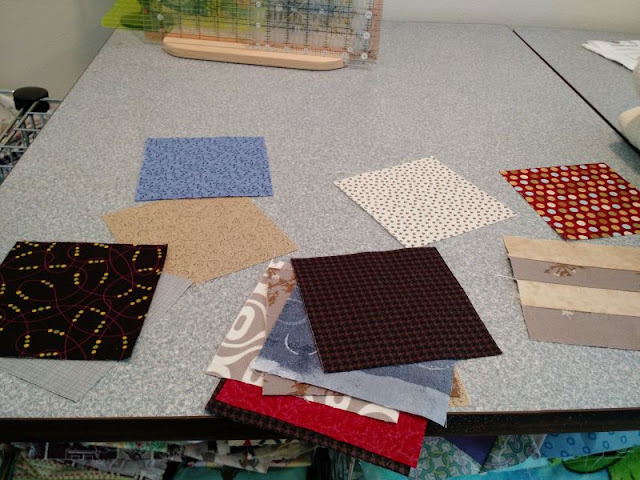 (I try to do donation quilts frequently.) Is there a way to make sure to keep in contact with you so that I can donate whenever something is added.